Griff the Invisible… Australian superhero genius. Here’s a nice little film, and my hot tip for this year’s sleeper success. Think Muriel’s Wedding, but with superheroes as the focus, rather than Abba. The film is about Griff, played by actor Ryan Kwanten, a geeky clerk bullied by his workmates. 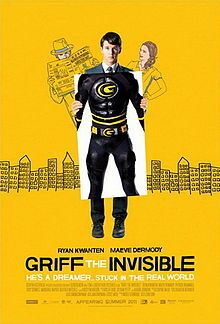 At night he is Griff the Invisible, an invisible superhero who roams the streets of his Australian town, protecting the innocent. Griff has his world turned upside down when he meets Melody – actress Maeve Dermody – the beautiful young daughter of a hardware store owner, who shares his passion for the impossible. He uses his ‘powers’ as an excuse for not having a relationship, because Melody might get hurt… the ‘ol Peter Parker ruse. But she knows something he doesn’t. An intelligent, subtle superhero film, for once.